When it comes to traveling with tripods, you definitely want to choose one carefully because the wrong decision can end up feeling like a ball and chain, leaving your back screaming for mercy. You need to straddle the line between those must-have features and finding a product that delivers them without unnecessary weight. The MeFOTO RoadTrip Travel Tripod Kits meet those criteria. A handsome marriage of form and function, these RoadTrip kits are lightweight, full-featured, and available in aluminum in eight cool, contemporary colors. They’re also available in carbon fiber, but only in two colors—titanium and black. Aluminum models weight 3.6 lbs and carbon fiber only 3.1 lbs. These tripods support up to an impressive 17.6 lbs—that’s more than four times their own body weight. No slouch in the height department either, the RoadTrip has all the bases covered with minimum and maximum extensions of 15.4″ and 61.6″, respectively. A smart twist-lock, folding-leg design allows the RoadTrip to pack down to a very compact 15.4″, a quarter of its extended size, making it easy to fit into a backpack, overhead compartment, or its included shoulder-strap case. 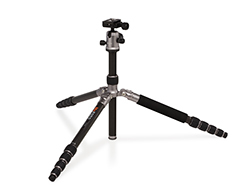 Shooting in cramped spaces, on irregular surfaces, or at ground level can all be handled with ease via the RoadTrip Travel Tripod’s independent, dual-locking leg positions. The tripod can also be converted in seconds (without tools) into a full-size monopod. The Kits include a Precision Matched Q Series Ballhead equipped with 360º panning; separate head and pan lock; integrated bubble level; Arca-Swiss-style quick-release plate; and recessed center-column hook. Smartly designed, lightweight, compact, and with all the must-have features you want, MeFOTO RoadTrip Travel Tripod Kits are real winners at home or on the road.